I categorise myself as and aspire to be a liberal Irish republican. By that I mean that my politics are based on liberal democracy in a state which is governed by the free will of a majority and which accords protection to the rights and liberties of all of its citizens equally. The term “republican” denotes for me a state which is the servant of all its citizen and the master of none of them – a state that is not in thrall to any privileged elite or self-selecting minority. The word “republic” is hi-jacked by many regimes which are the opposite of republican. as in the case of Kim Jong Un’s DPRK. In an Irish context, I favour and am loyal to the concept of Irish independence and I believe that independence has been immeasurably better for Ireland than remaining part of the United Kingdom; I also believe that Ireland should reject any proposal to become part of a sovereign European super-state. I believe that a partnership Europe such as we have is good for Ireland. On Irish unity, I favour that too. I recognise, however, that the two parts of Ireland can and should only be united when a majority in each part is comfortable with that outcome and with the terms on which it can be achieved. What, then, do I make of modern Sinn Féin? Do I think it is a republican movement? Do I think it is a democratic movement? Do I think it is more likely to bring about Irish unity than other parties? Let me elaborate. I think Sinn Féin is still an undemocratic, marxist movement masquerading as a conventional political party. Most of its members are probably unaware of its true nature. Let me pose two questions. Why did Sinn Féin recently spend a large sum sending a delegation to the inauguration of the undemocratic marxist, Nicolas Maduro, as president of Venezuela? How precisely was Michelle O’Neill chosen to succeed Martin McGuinness as leader of Sinn Féin in the North? In the case of Maduro, the Provisional movement have long backed communist movements in that region. They sold their weapons technology to the Farc communists in neighbouring Colombia in exchange for millions of narco-dollars. They had, despite denials, a permanent representative in Castro’s Cuba. The common thread was a belief that they were and are a revolutionary movement with a marxist orientation. Readers of An Phoblacht over the years will remember the constant stream of supportive articles for marxist revolutionary groups internationally. It should come as absolutely no surprise that the party sent a delegation to Caracas to celebrate the subversion of democracy in what used to be one to Latin America’s most liberal states. This may not lie easily with the polished, bourgeois professional image which the Party seeks to create using Mary Lou McDonald and, until recently, the urbane Peadar Tóibín. But the truth is that Sinn Féin is rigidly controlled by a small clique of Provo veterans who are puppet-masters in what appears to be a normal democratic party. It was they who chose Michelle O’Neill. It is they who secured the unopposed election of Mary Lou as the party’s Uachtarán. It is their network of commissars who impose order and discipline on the party’s members. It is they who decide on strategy. It is they who will decide if and when the party resumes participation in the NI executive. The peculiarly high rate of resignation by elected members of the Oireachtas and county councils, many citing bullying, is but the tip of the iceberg of rigid control from the boys in Belfast. It has been going on for years. Even the veteran republican MP, Francie Molloy, was instantly suspended for publicly disagreeing with the boys in Belfast on the party’s stance on local government reform in the North. Recent evidence before the “cash for ash” inquiry revealed that Sinn Féin ministers in the Northern Executive had been completely subject to order and control from their official “advisors” who in turn received direction from un-named senior party figures in the backroom hierarchy in Belfast. The same pattern is to be found in the Oireachtas. Sinn Féin members of the Dáil and Seanad do not have conventional parliamentary party meetings to decide on policy matters or voting intentions in those Houses. Their “line” is not decided by their spokesmen or by anything like a frontbench meeting of elected members. It is handed to them by unelected party apparatchiks who receive it from the mysterious centre. The same applies to the party’s councillors. Even speeches are pre-written and supplied to the parliamentarians for delivery. There is little or no discretion left to any of them on an individual basis. Other parties are tightly whipped but their members can sometimes indicate in their contributions that they are unhappy with the party line. Never so with Sinn Féin. Public dissent or even the hint of it is utterly forbidden and is ruthlessly dealt with as disloyalty. In true marxist style, the entire party is subject to what Lenin described as “democratic centralism”. Sinn Féin members of the Oireachtas do not choose their advisors, interns or secretaries. The party commissars make those decisions. By this means all vestiges of political privacy and autonomy are absent. We are still somewhat in the dark as to whether the party confiscates its public representatives’ earnings and allowances over certain average industrial wage thresholds to apply them to party purposes under the guise of a voluntary contribution to the support of the party. Public representatives are routinely informed of their intended de-selection by paid party officials. Why does all or any of this matter? It matters if a party that is under external, invisible control seeks to be part of our government. It matters if that party hides its true ideology under a PR veneer. It matter if a party seeks to usurp and pervert the true meaning and values of the republic. It matters if the cause of Irish unity is commandeered by a party which puts commemoration of its “war dead” ahead of reconciliation of Orange and Green. It matters if the Good Friday Agreement is put in cold storage on the dubious basis of language policy or Arlene Foster’s suitability for office. Most Sinn Féin members, elected and un-elected, are outside the loop of decision-making. Their Árd-Fheiseanna are just as controlled as the rest of the party’s activities. Very few of them have experienced being members of a party that allowed dissent, free and open discussion, or personal political autonomy. They know no better. They are dupes. 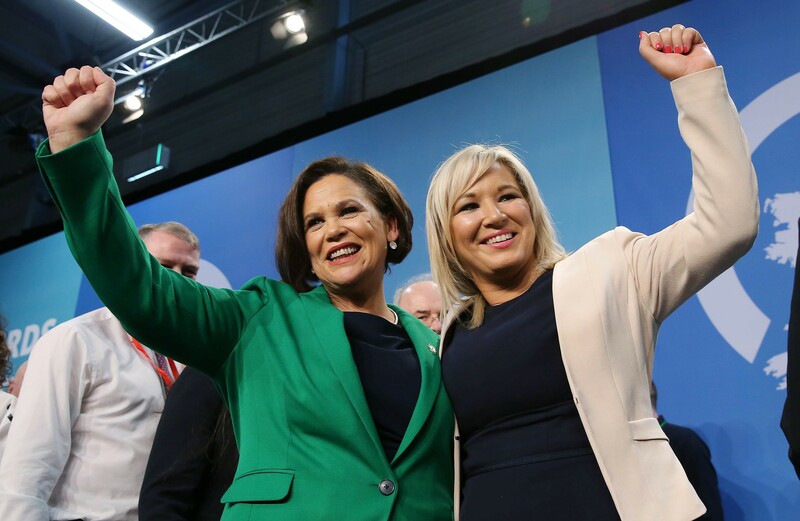 But I do not believe for one minute that Mary Lou or Michelle is in charge of the party rather than the old gang in the backroom of the Felons’ Club on the Andersonstown Road. If the party does not make sufficient progress at the polls, either or both of them will receive a tap on the shoulder from the Felons’ Club – not from the ordinary members. That leads me to the interesting question of the FF/SDLP merger proposal. It must lessen the chance of an FF/SF coalition in the South. The eradication of the SDLP in the North is an urgent Provo aim. The much weakened SDLP stands in the way of an SF First Minister elected. No wonder the old Provos fear such an alliance. Sinn Féin is not a democratic or republican party. It remains a carefully constructed façade for a small, manipulative and undemocratic clique with very different values. Dissent and individual political judgment in political parties are the canaries in the coalmine. If you don’t hear an odd chirp, beware.